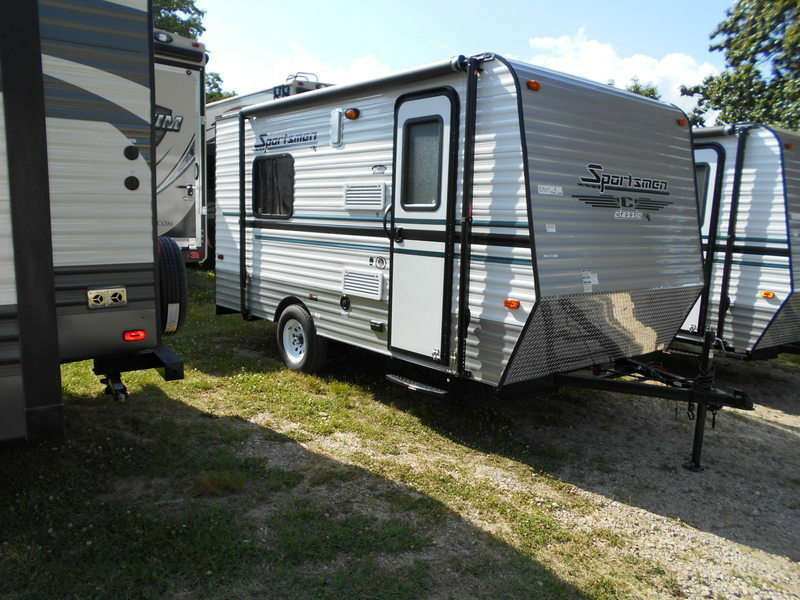 Sportsmen Classic Toy Hauler Travel Trailer, Rear Ramp Door, Double Flip Bed/Sofa, Closet, Private Toilet Area, Single Kitchen Sink, 2-Burner Range, Refrigerator/TV Antenna, Overhead Cabinets Throughout, 11' Awning & Much More. 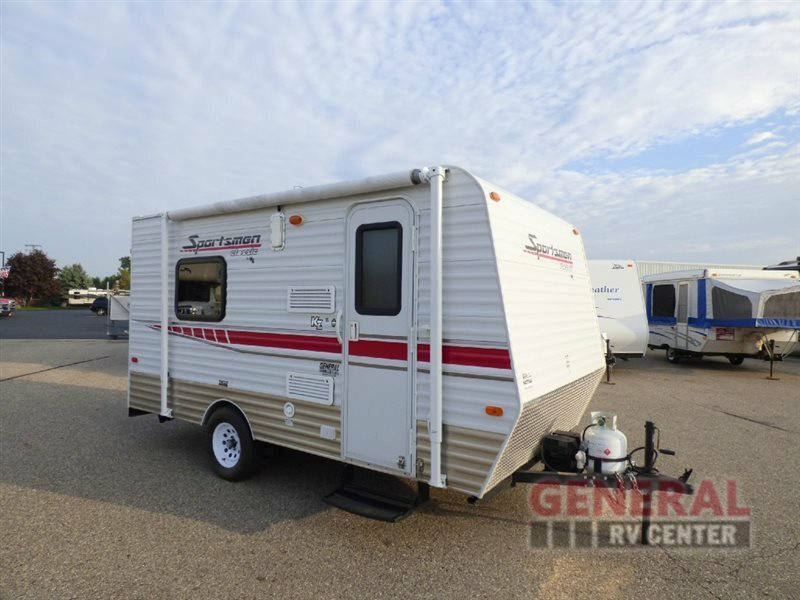 2014 KZ RV Sportsmen Classic 16FKTH, 2014 KZ RV Sportsmen Classic 16FKTH The Sportsmen Classic Toy Hauler is value packed, lightweight and provides all the camping essentials. This versatile trailer transforms from a toy hauler to a travel trailer by folding down the two flip beds. In toy hauler mode the toy box provides a 7' 7 ¼" cargo area. 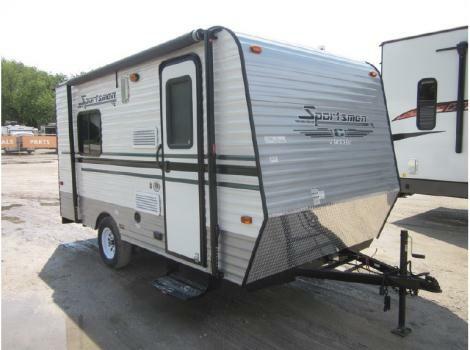 The Sportsmen Classic Toy Hauler is available in 1 floorplan that is 17' in length and only weighs 2,315 lbs. 2015 KZ RV Sportsmen Classic 16FKTH, 2015 KZ RV Sportsmen Classic 16FKTH Theres a lot to be said for timeless simplicity. Good things come in small packages, like the Sportsmen Classic, engineered for todays smaller tow vehicles. The Sportsmen Classic provides all the essentials you will need including kitchenette, closet, dinette and overhead cabinetry. Additionally, choose from our list of popular options to personalize yours. CLEARWATER LOT --- TOY HAULER --Front kitchen, Side wet bath, Sofa/bed, Furnace, A/C, AM/FM/MP3/IPOD Radio, 4 Stabilizer jacks, Rear cargo w/ramp, Patio awning. Approx. wgt. 2,280 lbs. There¿¿¿s a lot to be said for timeless simplicity. The Sportsmen Classic provides all the essentials you will need in a small package. 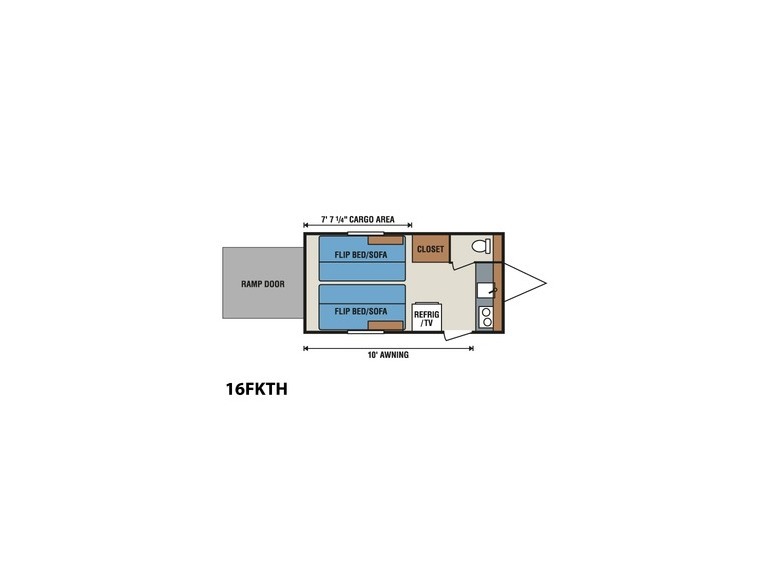 2015 K-Z Sportsmen Classic 16FKTH, The Sportsmen Classic 16FKTH toy hauler travel trailer by KZ offers a large ramp door for easy loading and unloading your off road toys.In the cargo area there are two flip bed/sofas. You will also find a large closet on one side and a refrigerator on the other side.In the front, is a two burner range, and single sink surrounded by ample counter space.There is also a convenient toilet area located in the front of the travel trailer. 2014 K-Z Sportsmen Classic 16FKTH, Sportsmen Classic toy hauler by KZ-RV Inc. - 1,240 lb. cargo capacity | Cargo length 12&apos; ( 7&apos; 9" to cabinets), Width between cabinets 32" | *Axle weight 1,893 lbs. | *Hitch weight 400 lbs. | Ramp door 60 wide by 70 tall | Rear door opening dimensions 58 3/4 W X 66 3/4 H | 2 burner gas hot plate, 3 CU Ft. gas/electric refrigerator, Single bowl sink, Overhead cabinets, 10 Gal. fresh water tank, Tinted windows, City water fill, 12 V water pump, 12 V converter w/charger, 13" tires, 1 Piece aluminum roof, R-7 insulation, Microwave, 2 flip sofa/beds, Folding table, TV antenna, 6 Gal. gas water heater, Single gas bottle, Spare tire, 2 stabilizer jacks, Awning, Shower & toilet, Furnace, A/C. *Note: Axle and hitch weights are approximate as provided by manufacturer s brochures and are not guaranteed by KRENEK RV. Weights may vary according to optional equipment. Weight: 2,260 lbs.